Sponsored by Sqn Ldr B. K. Hinton, ex-Officer Commanding, 2007, Royal Air Force Mount Pleasant, Falkland Islands, dedicated to all who served. “It takes effort to get a badge made and authorised. 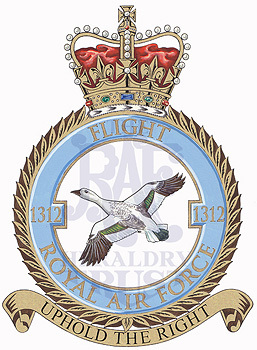 I designed as submitted for approval the 1312flt badge. From the initial idea of designing the badge to getting royal approval took three years. Thinking of the design and motto, designing the badge, doing the initial artwork, writing and submitting the approval and subsequent correspondence is a lot of work.